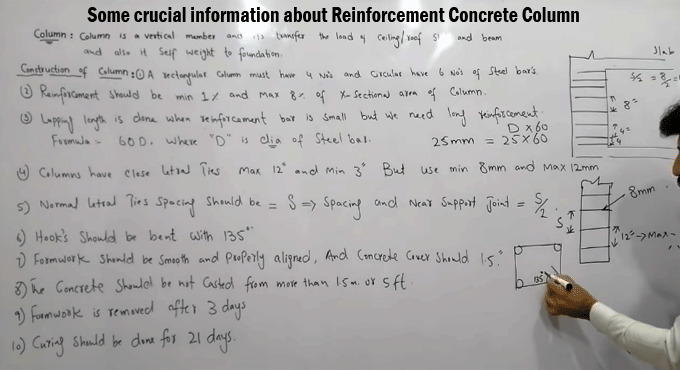 In this construction video tutorial, the civil engineering students will get some vital information on RCC column. RCC column belongs to a vertical member that transmits the load of roof, slab, ceiling, beam as well as it’s own weight to foundation. 1. A rectangular column should contain 4 numbers of steel bars and a circular column should contain 6 numbers of steel bars. 2. Reinforcement should be at least 1% and highest 8% of x-sectional area of column. 3. The lapping length should be provided when the length of the reinforcement bar is small and long reinforcement is required. 4. The lapping length can be determined with the formula like 60D, where ‘D’ denotes diameter of bar. 5. If there are lateral ties in columns, the maximum spacing should be 12 inches and minimum spacing should be 3 inches. But it is recommended to utilize minimum 8 mm steel bars and lateral ties and maximum 12 mm. 6. The spacing & near support joint for normal lateral ties (represented as S) should be S/2. 7. The curve of hooks should be 135 degree. 8. Prior to commencement of concrete work, formwork should be smooth and arranged properly. The dimension of concrete cover should be 1.5 inches. 9. While casting concrete for beam, column, slab; it should not be casted from in excess of 1.5 m or 5 ft to avoid segregation. 10. The formwork provided to RCC column should be detached after 3 days to retain perfect strength. 11. Curing for concrete column should be provided for 21 days to keep it’s strength.